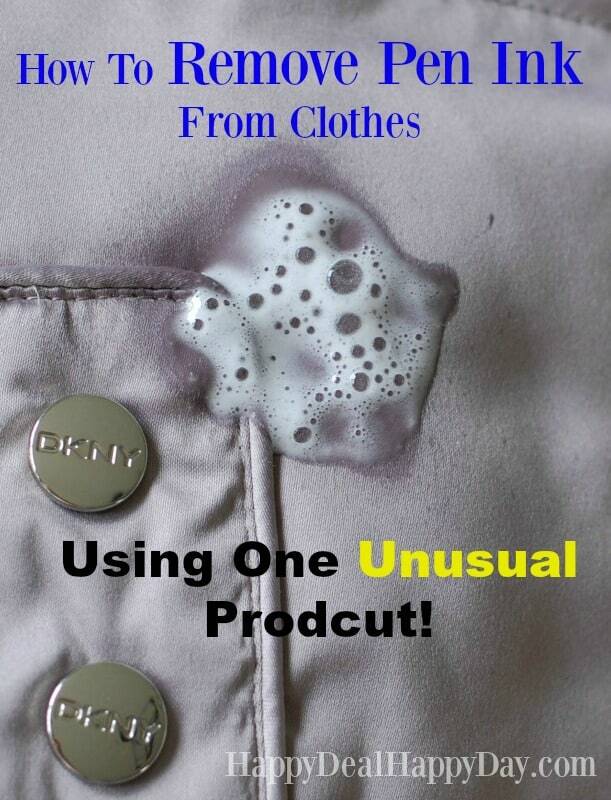 How to Remove Pen Ink From Clothes - Using One Unusual Product! | Happy Deal - Happy Day! 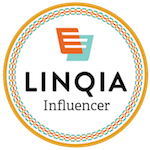 If you are an avid reader here, then you know that I love shopping over at 6pm.com for their awesome deals (and post deals daily in my HOT Online Deals Facebook Group!). 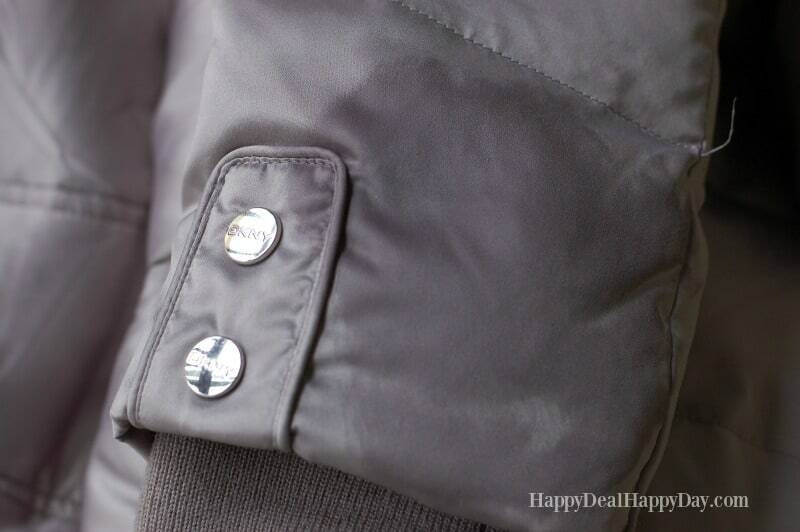 One of the deals I posted last month was this DKNY Belted Short Fur Hooded Jacket. 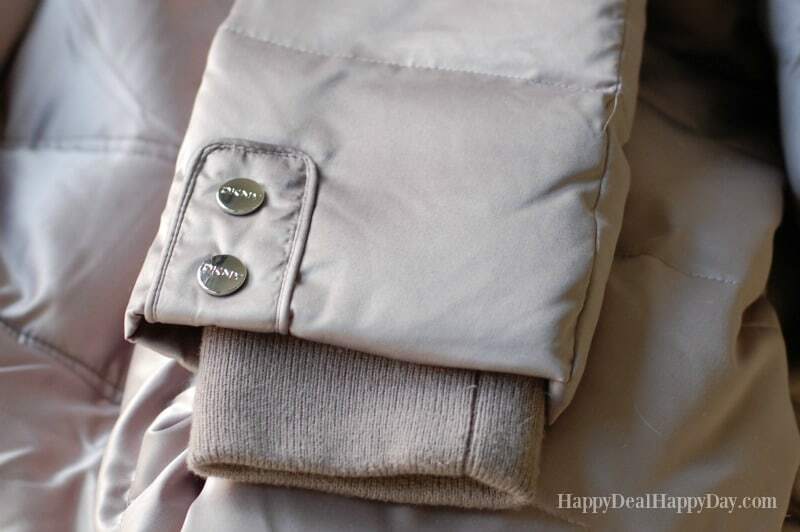 I personally could not pass up this deal and I just LOVE this jacket!! 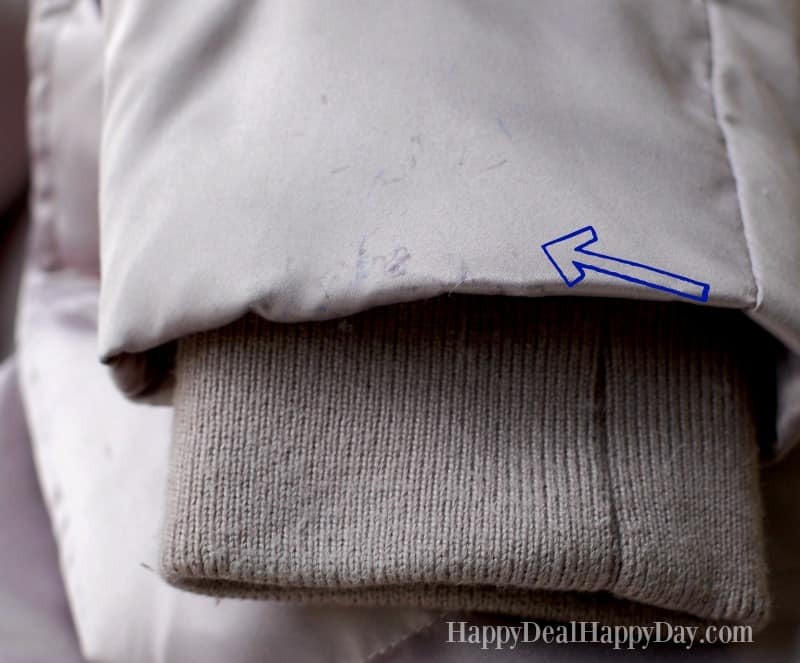 Bad news though – I’ve recently gotten pen ink all over the sleeves of my new jacket. How does one get pen ink all over the sleeves you ask? Well, while I’m out doing my weekly grocery shopping trip at Wegmans, I push the cart with one hand and hold my small coupon holder organizer, list, and pen in the other hand. The problem is that I noticed I always hold the pen facing down toward my sleeve, and since then have discovered some nice “art work” of unwanted pen ink on my brand new jacket sleeve! 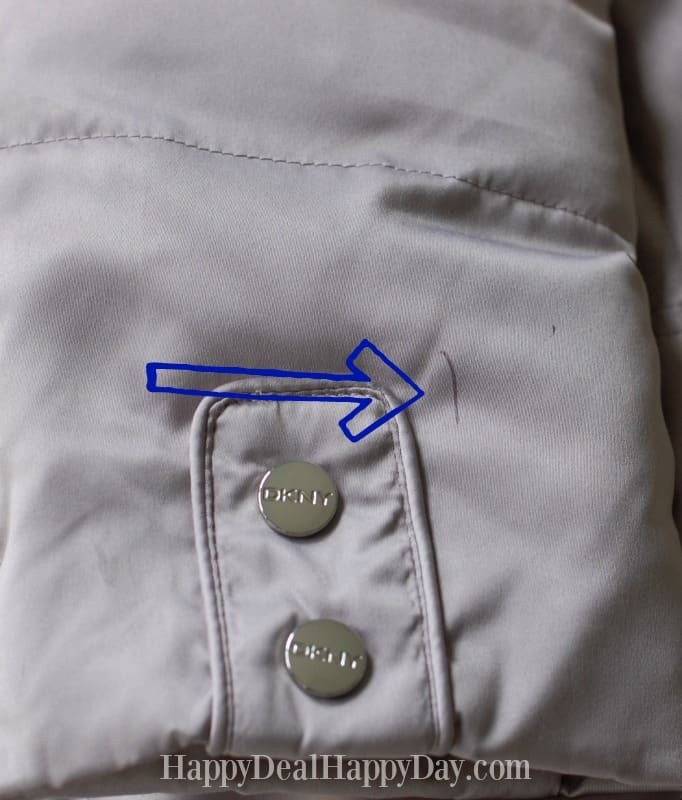 Now even though I was marking up my new coat with pen ink, I DID NOT PANIC! I know the magic solution of how to remove pen ink from clothing! The answer? HAIRSPRAY! Get an aerosol spray bottle of hairspray and sprtiz a healthy amount on the ink spot. Get a damp sponge and rub the hairspray into the ink stain. I believe that the alcohol in the hairspray is the solvent that breaks down the ink and makes it disappear. Here is my coat after just a minute of spraying with hairspray and rubbing out the ink. You may need to do this a couple of times for the ink to fully disappear. Now my coat is dry and ink free! Pretty cool, right?? What other ways do you know how to get ink out of clothing? 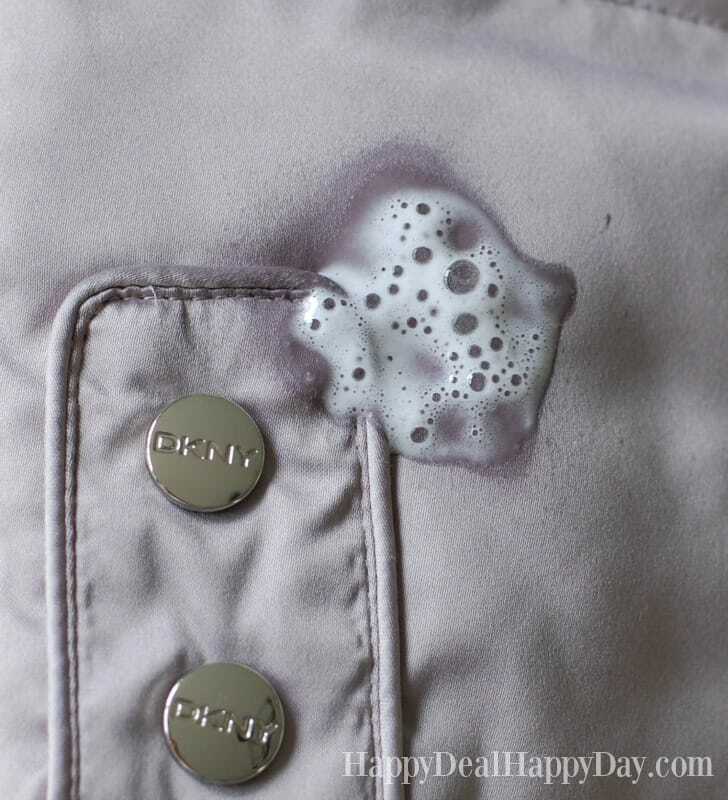 What other fun stain remover techniques do you use? I totally would never have guessed that this would actually work to remove pen ink from clothes! 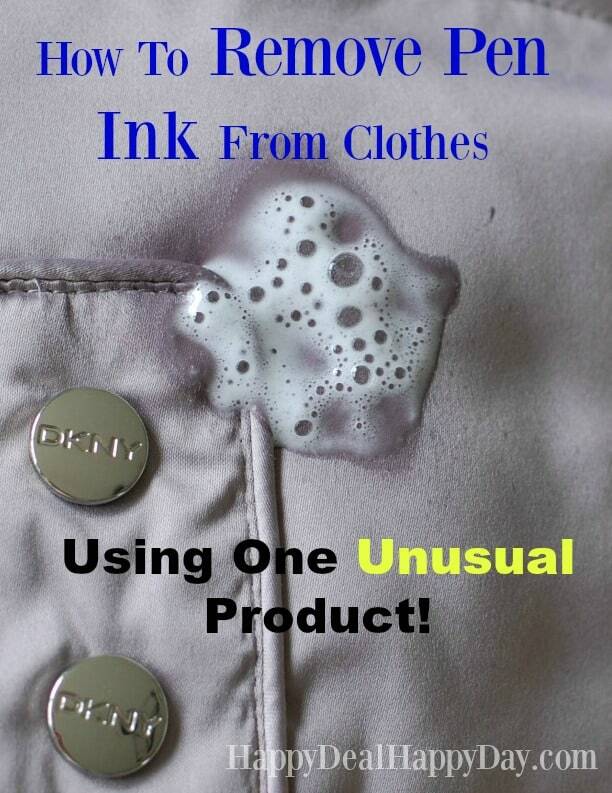 10 Responses to How to Remove Pen Ink From Clothes – Using One Unusual Product! Yes, it does work. I used to be a hairdresser, & we used it to get hair dye out of clothing too, if you act fast! Rubbing Alcohol also works brilliantly for Ball pen stains on clothes or upholstery too. Just apply, leave a little while & wash straight after to remove any ‘runs’. i used to use metholated spirit, that purple liquid stuff one uses on glass etc, well i had a dress uniform where a biro completely empties in my pocket and i was going to be in big trouble. But thankfully i soaked the area in a small dish with this and all came out…phew…. 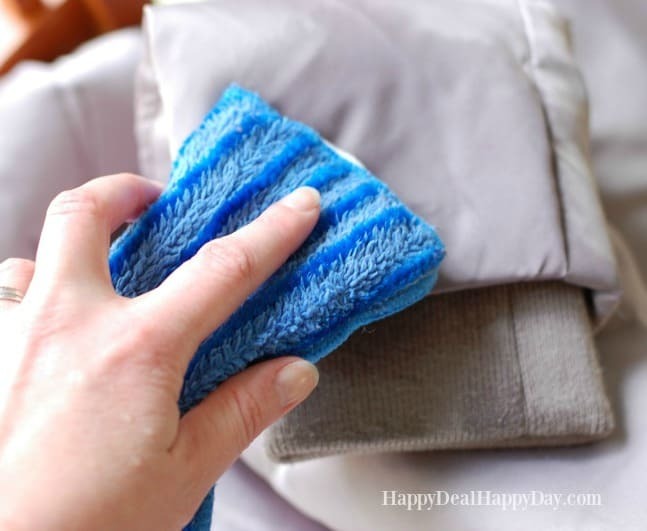 use it to wipe on some chairs too that were not leather but made to look like and it may work on shoe polish on floors too. I also once use lard to soften tar walked into the house on shoes. Sounds pretty cool but being a man that doesn’t use hairspray the first thing that comes to mind is how does the oil from the hairspray not leave an oil stain? All hairsprays I’ve seen women use have something oily in it. What kind of hairspray do you use for that? I may keep some handy just for that purpose. After you launder your clothing after using the hairspray – all is washed out. No oily stains! I don’t think hairsprays are filled with oils. Nini can I ask what kind of hairspray you used? You are the first person to tell me it didn’t work. Also what was the ink. Would love to know the combo so I can advise everyone else! Great news Lu – thanks for sharing! I have about 7 items of clothes that got ink all over them. My sweet two year old opened the dryer and tossed a pen in and well here I am. Do I have to spray each ink stain one by one and blot then wash? Please tell me I’m able to able somwthing let set them wash.
Oh dear – I can totally picture my now 5 year old doing the same thing! !